Wow! That’s the word for this book. A staggering, epochal work of extraordinary dimensions. In an era when print gets increasingly short shrift from the cell-phone and digital-pad publics, we can enjoy reading again. Former racer and movie-maker Peter Starr has delivered. This is a compulsively page-turning work that captures the golden age of motorcycle sports on and off road and track. Not a dull page in it. Starr’s first-person text is written in a modest, readable style that reveals his no-nonsense character. He pulls no punches, discussing his challenges, successes and failures (including poignantly admitting how his workaholic nature prevented him from enjoying companionship and married life as he would have wished). He goes into enough detail to put the reader into time and place engagingly. He gained the cooperation of many great national and world champions, including their work as camera bearers carrying on their bikes some strange—yet effective—camera lash-ups. He acquired their enthusiastic help based primarily on his engaging personality and his Brit gift of gab. Hundreds of color and black-and-white photos, plus track diagrams and maps, make this perhaps the best-illustrated motorsports book ever conceived. Many ‘names’ contributed, offering candid portraits of great riders, and dramatic, intimate action shots, helping Starr flesh out his words. Several industry publications participated. The reader realizes that Starr is an international treasure who captured motorcycle sports on film worldwide in ways no one else matches. Making movies has always been one of the most challenging blends of art and business—you need actors, sets, scripts, costly equipment, highly skilled technicians, lots of time, money and business savvy. Starr’s task was always compounded by his having little or no . . . anything, except enthusiasm and perseverance. Much of his work and his technology were ad hoc, unprecedented. His ‘actors’ were professional motorcyclists disinterested in faking anything. His sets? Locations, in any weather. Little could be scripted. Starr cobbled together equipment that was often unsuited to the task, such as gun cameras from fighter aircraft with severely limited film capacity—a few minutes—long before today’s two-ounce ‘lipstick’ CCD video cameras and telecommunications. Mounting an eight-pound camera on a helmet was a major struggle and risk for riders. Camera mounts on bikes had to create stable platforms despite severe shock and vibration. Starr had to find cinematographers and sound technicians wherever he could, and could rarely pay them as much as he would have liked—they shared his enthusiasm and hung in, often at intense personal discomfort and risk. He fought the clock, always—in racing, motorcycles vanish in the blinking of an eye. His budgets, he admits, were usually less than they should have been, stretched to the limit. He had to rely often on the kindness of manufacturer and track staffs, and strangers who understood and supported him. Legal complications over his feature film—the distributor went bust and took the earnings—made life hell. Still he endured. What is extraordinary in the book is the insight and internal detail about the machines, the tracks and especially the racers, never shown before in this way. Starr wanted to know about, see and film every form of motorcycle competition except stunts (they belong in a category of their own). He was indefatigable. He brought it all back, alive, in his film canisters. The upcoming, digitally-remastered DVD of his film “Take It To The Limit,” will be seized and treasured by enthusiasts. The book is not entirely without faults but they are not worth dwelling upon. Covering the IoM TT, Starr writes, for example, that “several riders have lost their lives in Isle of Man races.” Several!? The actual number: 225-plus and counting. Your own motorcycling viewpoint will determine whether you should buy this somewhat expensive book. If you’re only idly curious about motorcycle sport or ride for utility rather than enthusiasm, this book might not be for you. But if, like most riders I know, you have a bone-deep affinity for a remarkably challenging and fulfilling sport, get it now. Look at it this way, when riding may be uncomfortable or dangerous, or not even feasible: for the cost of a few tanks of gas, you get hours of pleasure living vicariously through the eyes and enthusiasms of a great cinematographer, plus permanent memories in your bookshelf. 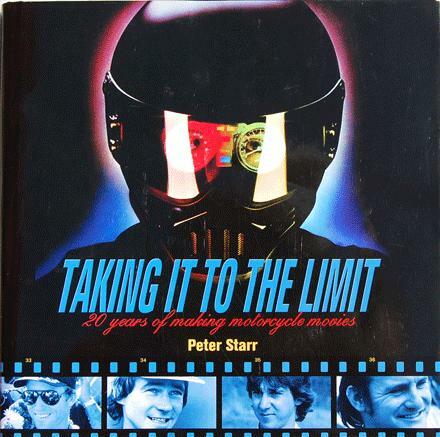 By Peter Starr, published by MotoDVD.com 262 pages, 500+ color and black-and-white photographs, free DVD $50. disregard, just spotted the name above. MD, did you guys plagiarize the amazon review or vice versa?